We love dogs, and we love phones. But how well do dogs and phones get along? Spencer seems to confuse a phone voice with a small bird helpless on the ground :) https://www.youtube.com/v/zrZ6FtdC3vk This bi-colored Jack Russell desperately wants to answer the phone, if only he could open doors and pick it up. https://www.youtube.com/v/eYLdtRykxw8 This Yorkie has a promising future as a phone tree attendant: https://www.youtube.com/v/k0qIMAv1XGo Who can't help but feel sympathy for this loving lassie's desperate attempt to understand the phone: https://www.youtube.com/v/-k59uh3K4N4 I'm not sure this is 100% real ... but its 100% funny! https://www.youtube.com/v/PPLwCk7AQD4 What are your best dog and phone stories? Feel free to share in the comments section! 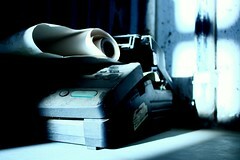 It’s 2009: Why Do You Still Use a Paper Fax?